The Anterior Bariatric Safety Roller can accommodate patients weighing up to 500 Ibs. They are designed with all the qualities and features of the standard adult Safety Rollers plus more!! The Bariatric Safety Roller is available in two models and feature height and width adjustments for the perfect fit. My husband is 6'5" and weighs almost 350lbs. He has been using a walker of this type for 2 years it was supplied by Medicare. However it did not meet his needs. First the wheel fell off and then the pole support on the side of the walker broke in half. I refuse to deal with these [other] people anymore, my husband's life is in danger!! Now we decided to get another walker that fets his needs. This seems like an excellant fit for him. The totalweight bearing load is over his needs. 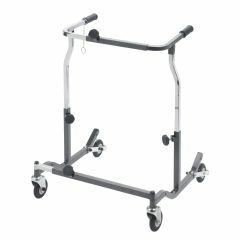 My one question before I order what is the maximum height that the walker can adjust to? We need one over 42" or more. Thank you.